Our Teeth Whitening Kits are Gluten Free, BPA Free, Cruelty Free, Vegan, 99% Kosher, and made in the USA in an FDA registered facility. How do I use my new Sparkle White Teeth Whitening Kit? 11) Store everything in a clean dry place for next time. For best results store LED with batteries removed. How long will my Sparkle White Teeth Whitening Kit last? Each kit contains enough gel to whiten at least 10 times. For best results use every 3-4 days until you reach your natural white shade. You can whiten up to once per day if you need to whiten quickly. We recommend whitening once a month once you reach your natural white shade. Should I brush my teeth prior to whitening my teeth? Yes, but we recommend using a soft tooth brush and flossing as well. Does the product Whiten Caps, Crowns, Bonding & Veneers? Our products are safe for fillings, crowns, false teeth and other dentail work. In addition it will whiten dental work along with the teeth. However, the dental work will not get any whiter than it started. If it was matched to yellowed teeth then your teeth may lighten more than the dental work. It will definitely make it shiny and bright again. Is your teeth whitening safe? Yes! Our products work by removing stains from the teeth. It will not damage enamel. Be careful not to get the gel on your gums. What is the difference between the peroxide & the peroxide free Teeth whitening kit? The peroxide free teeth whitening kit is great for people with sensitive mouths. Can I use with Braces? We recommend waiting until they are off for best results. 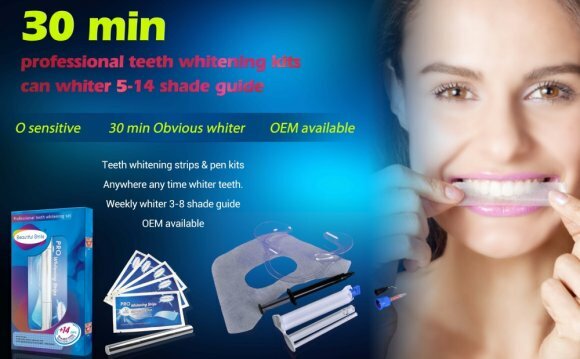 How do I use my teeth whitening kit? Why won’t my light turn on? 1)Remove the backing, remove the batteries, locate the clear plastic disc. I melted my trays, how do I get a new set? You may select them here Use coupon Trays at checkout. Be sure to shape one tray at a time, in water that has boiled and slightly cooled, for best results. Why are my gums white after treatment? Blanching of the gums can occur if gel gets on them during treatment. It is temporary and not harmful. The color will return in a few hours. Please use less gel next time and make sure it doesn’t get on your gums. If your teeth have calcium deposits on them you will notice those whiten first. It is not harmful and it is not permanent. Please continue with your teeth whitening treatment and it will all even out beautifully. You may use the treatment up to once per day to even them out quickly. We ship worldwide. Please select International shipping at checkout. Your bank holds the funds for the charge and will release the funds to you as soon as the transaction settles. In the U.S. that usually takes 3 days, outside the U.S. it can take up to 10 days. It depends on your bank’s policies. All of our pricing is in U.S. Dollars. International orders go through a currency exchange to covert the funds on your end to U.S. dollars. You will see the charge on your statement in your currency. The shopping cart lists that all prices are in U.S. dollars and we note it again on the emailed receipt for your convenience. I am outside the U.S how much will I be charged? All of our pricing is in U.S. dollars. Your credit card will convert the funds to dollars during the transaction. For current rates you may check with your bank or get an estimate from the internet. Orders are shipped within 3 business days. We send an email when your order is shipped from WWS and SSBP. Please check your spam folder for that email. Alternately you may login to your account and locate your tracking number for your order. Then enter it at USPS requires 72 hours to activate tracking links and they do not scan the package at every stop. Orders shipping within the U.S. arrive about 7 business days after shipping. Outside the U.S. please allow 2-4 weeks. My Package was scanned delivered, why didn’t I receive it? It arrived in a kraft or white colored bubble envelope with your regular mail delivery. You may want to double check with family members or neighbors to make sure someone didn’t get your mail for you and forget to mention it. Why am I missing an item? We are so sorry, we work hard to make each order perfect. Please email us at with your order number and what missing and we will correct the error.